High performance, high strength, high shine. No, we're not talking about a sports car, we're talking about the remarkable qualities of cobalt chrome, the alloy that's been taking over the world of alternative jewelry. It's one of the most brilliant metals on Earth, but its lightweight durability and hypoallergenic properties are just the beginning. Cobalt is one of the oldest metals ever used to make jewelry and art, and it was one of the first to have a global footprint. It was used as a pigment by the Persians over 4,000 years ago and was prized by both the Ming and Mayan empires on opposite sides of the world. Cobalt is even referenced in the Bible. But cobalt chrome? That's a bit more recent. Discovered in the early 20th century by the famous metallurgist Elwood Haynes, cobalt chrome (Co-Cr) is a specialized alloy that fuses cobalt with chromium to produce a luminous, ultra-corrosion-resistant metal. Although the discovery was almost accidental, Haynes immediately grasped the potential value of the new alloy and patented cobalt chrome under the name Stellite because the brilliance of the metal reminded him of the stars. Cobalt chrome has played an important part in modern civilization and technology ever since. You mean cobalt chrome isn't just for jewelry? Much like titanium, cobalt chrome is now found in everything from precision machines to biomedical implants. Because of its high resistance to wear, cobalt chrome is frequently used in cutting tools, engines, turbines, and firearms, while its inherent strength has made it a critical component of modern transportation, with applications in cars, planes, and more. Since the middle of the 20th century, cobalt chrome has also been an important part of modern medicine. Like titanium, cobalt chrome is bio-inert, making it perfect for dental implants, joint replacement therapies, and prosthetic limbs. Many people reading this may have the same grade of cobalt chrome that we use in our rings somewhere inside them right now. So cobalt chrome isn't going to give me hives or make my skin break out? Even if your skin is like a delicate flower, cobalt chrome is safe to wear. The non-reactive properties that make it safe for medical applications also make it safe to leave against your skin, 24-7. What's the difference between cobalt and titanium? They have a lot in common, but there are a couple qualities that distinguish cobalt chrome from its cousin. First, it's actually stronger than titanium. As much as titanium is rightly celebrated for its strength and durability, cobalt chrome is right up there with it and even edges it out in some areas. By way, just like titanium, cobalt chrome rings can be cut off in an emergency. The second and biggest difference between the two metals is brilliance. Titanium has a very nice, sleek luster that is comparable to platinum or silver, but cobalt chrome outshines them all. Look at a fully polished piece of cobalt chrome under direct sunlight, and you can absolutely see why Haynes chose to name it after the stars. Having an astonishingly bright ring might not be right for everyone, but you can't deny how impressive it looks. Does that mean cobalt chrome is superior to titanium? No… Just… different, with a lot of nice features. But is cobalt chrome impervious to wear? Anything less than a band made entirely out of diamond is going to wear down eventually, just like today's mountains will be hills in a few million years. It's the way of the world. But cobalt chrome will go the distance, and it will outlast just about anything else you could wear on your finger. 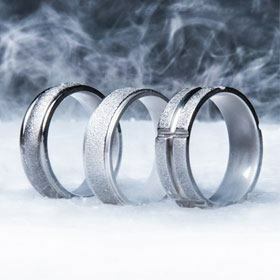 Cobalt chrome rings will not corrode or tarnish. They will not chip or shatter. They will maintain their luster for a hell of a long time, but only if you treat them with the proper care. And by care we mean common sense -- day-to-day wear is one thing, wearing your ring while fixing an engine with your bare hands is something else entirely. If, one day in the distant future, you notice some scuff marks, or if you feel like your ring just doesn't have the same amount of polish it used to, let us know and we'll take care of it. Send it our way and we will refinish it. Can cobalt chrome rings be resized? Our rings are crafted from some of the finest and strongest materials in the world, and much of the work we do is precise on a scale that is nearly invisible. Because of this, many of our ring styles cannot be resized. This is why before you even start shopping, it's important to know your exact ring size. 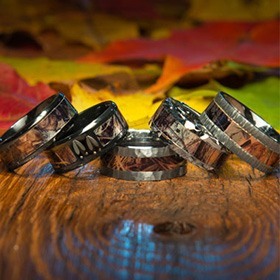 Most of our cobalt chrome rings are eligible for our optional Protection Plan. 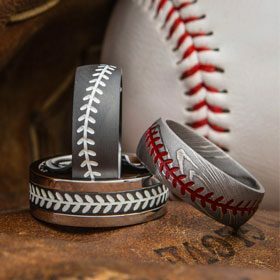 Customers who purchase the plan will be covered for one free size exchange during the first year that they own their ring. All you'll be responsible for is shipping. 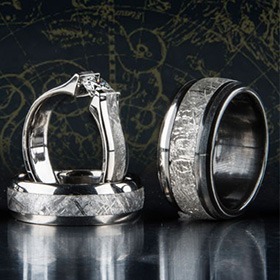 If you have an issue with how your ring fits, please call us toll-free at 1-866-215-1861 or send us an email. How do I clean my cobalt chrome ring? The same way you wash your hands: Soap and water. Seriously, that's it. Is a cobalt ring right for me? There are some questions in life that no one else can answer but you. This is one of those questions. But we will say this: If you want something that will last a lifetime, feel great, and have a brilliance that you've never experienced in another piece of jewelry, then a cobalt ring is the right choice for you. So, what are you waiting for? Start browsing our cobalt rings now and find the wedding band that's perfect for you.